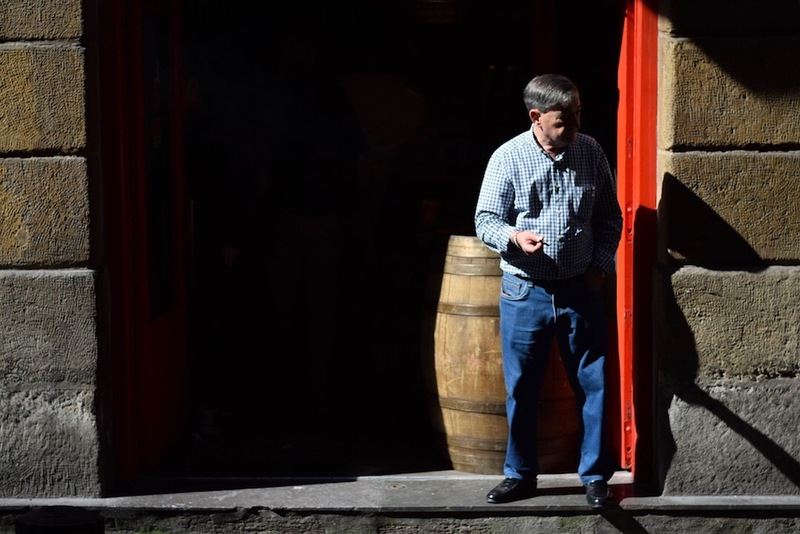 Our Spain travel expert, Ben Holbrook, takes a bimble through North Spain’s enigmatic Basque Country and reports back on some of the region’s very best places to visit… usually with a wine glass in hand. Check his itinerary below. Straddling the border between Spain and France, northern Spain’s Basque Country boasts rugged good looks, world-famous gastronomy and century-upon-century of culture, myths and legends. It’s a land of rolling countryside and virile vineyards, of tree-clad cliffs that tumble into the Atlantic Ocean. The cities are packed with tapas bars, where locals speak Euskera, a language unlike any you’ve heard before. It’s a land of rolling countryside and virile vineyards, of tree-clad cliffs that tumble into the Atlantic Ocean. So leave your preconceptions of Spain back home and let this ancient corner of the globe sweep you off your feet. Despite being the largest city in the Basque Country, and one of the most famous cities in Spain, Bilbao isn’t actually the the region’s capital. It is however one of the most important hubs of culture and commerce. It’s a pretty city that’s built along a river, where locals prowl the colourful streets, stopping at little bakeries, butchers and markets to pick up supplies. 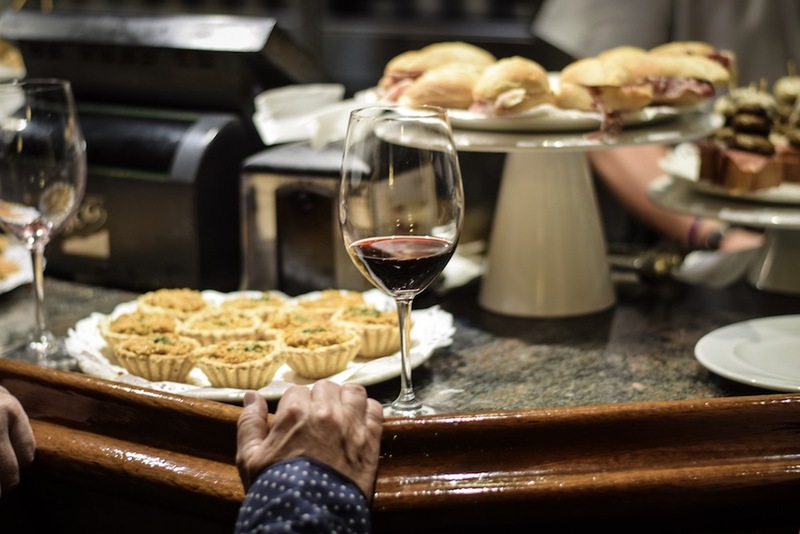 People here still have time for each other, to perch at a bar and chew the fat with their friends and neighbours over a glass of wine and some tapas. Bilbao’s protagonist is the otherworldly Guggenheim Museum. Designed by Canadian-American star-chitect Frank Gehry, this shimmering, titanium-clad art museum glistens like a spaceship that has crash-landed on earth after blazing through the atmosphere. Harboured inside its cavernous belly you’ll find a seemingly endless array of contemporary, and somewhat cryptic, modern art exhibitions. For many visitors, though, its main draw is the design of the building itself, as well as the spindly spider sculpture outside, called ‘Maman’. It was designed by Louise Bourgeois as a tribute to her mother – the frightfully huge scale and cage-like form of its splintery legs portraying a mother’s role as both predator and protector. 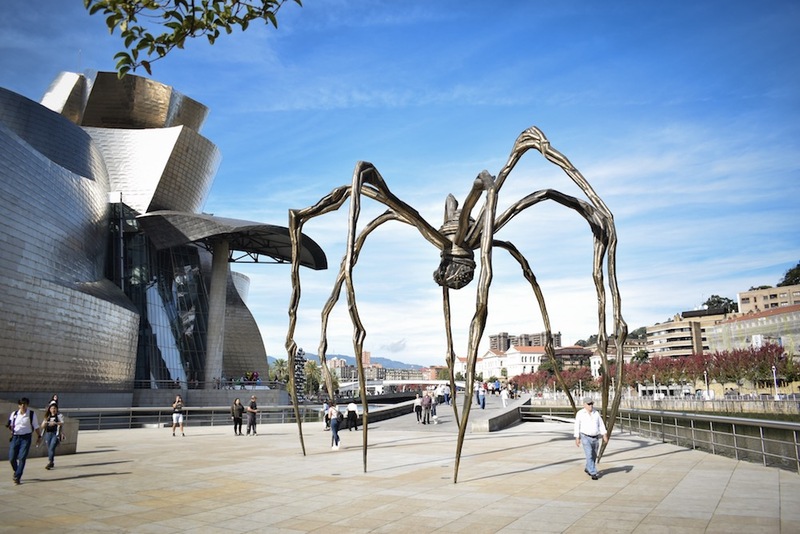 It was designed by Louise Bourgeois as a tribute to her mother – the frightfully huge scale and cage-like form of its splintery legs portraying a mother’s role as both predator and protector. From the Guggenheim, my friends and I took a scenic stroll along the river Nervión into the city centre, weaving our way to the square of Plaza Nueva. Nestled in the colourful warren of the Casco Viejo (Old Town) and lined by a host of traditional tapas bars and sunny terraces, it’s the perfect place for a pitstop and a bit of people watching. At lunchtime we waltzed our way around the bustling Mercado de la Ribera, which sits right on the river like a permanently harboured ship. 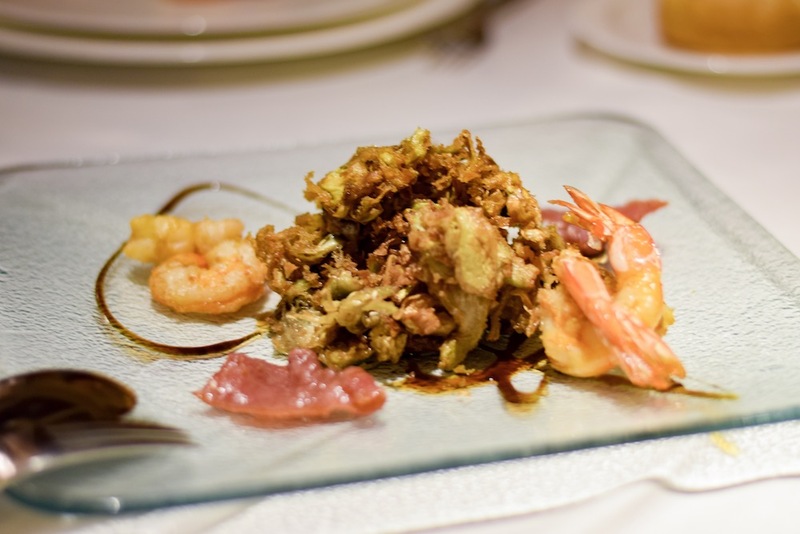 We squeezed around a table at the funky La Ribera Restaurant on the ground floor and threw ourselves mouths first into the Basque Country’s fabled cuisine: lightly fried squid and octopus with garlic, fresh salads and chunky steaks of cod drizzled in lemon. 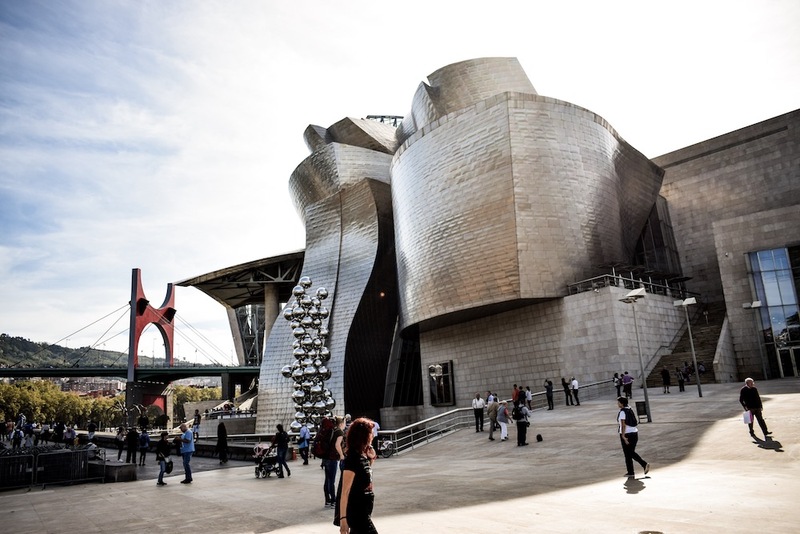 We washed it all down with a few bottles of red wine from the nearby Rioja region – this is what Bilbao is all about. 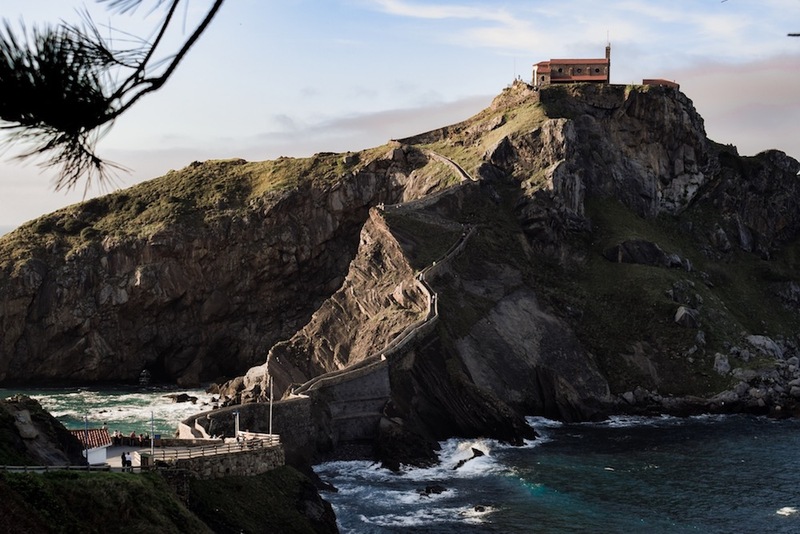 Not far from Bilbao is one of the Basque Country’s most dramatic natural beauty spots, a craggy islet called Gaztelugatxe (“Castle Rock”) and easily one of the most unique destinations in the region. If you’re a Game of Thrones fan then you may recognise it as Dragonstone from season 7. Situated in the Bay of Biscay, battered by the Atlantic waves, it’s connected to the mainland by a zig-zagging stone bridge and looks like something straight out of a fairytale. Adding further mystique is the crowning church of San Juan de Gaztelugatxe, which dates back to the 10th century. I didn’t have time climb the stairs up to the church, but hiking down the verdant cliffside, which smelled like damp wood and summer rain, to get to the foot of bridge was a heart-pounding adventure in its own right. If there’s one drink you absolutely must try when in the Basque Country it’s txakoli (pronounced ‘cha-ko-lee’). Made with the relatively unknown Hondarrabi Zuri grape variety, this dry white wine has a slight natural sparkle to it and a refreshing acidic bite. 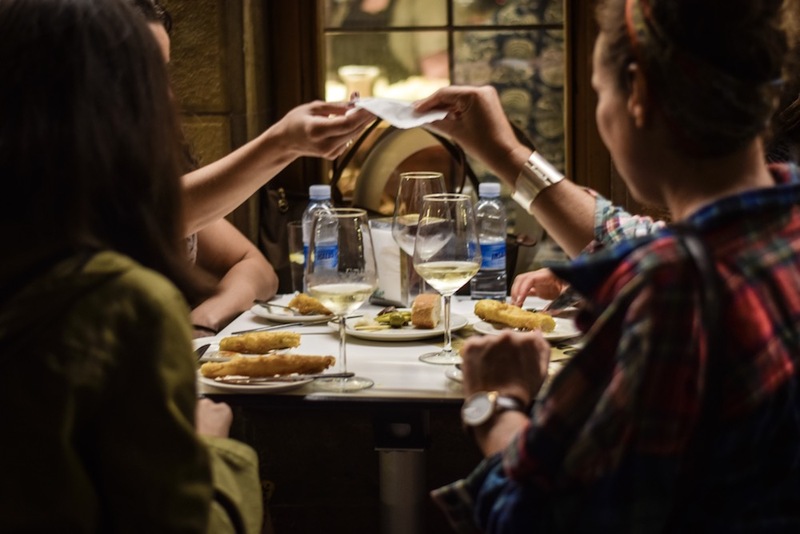 The Basques drink it day and night, though typically it’s enjoyed as an aperitivo with a few tapas before lunch or dinner. 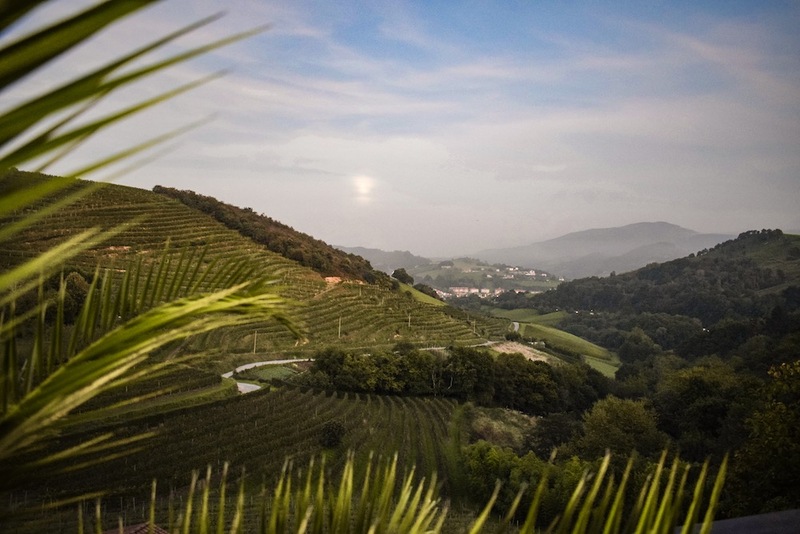 The txakoli wine region, known as Getariako Txakolina, is made up of the rolling vineyard terraces that blanket the hills surrounding Getaria and Zarautz. It was here, at Bodega de Txakoli Talai Berri, that I got to taste a few glasses straight from source. 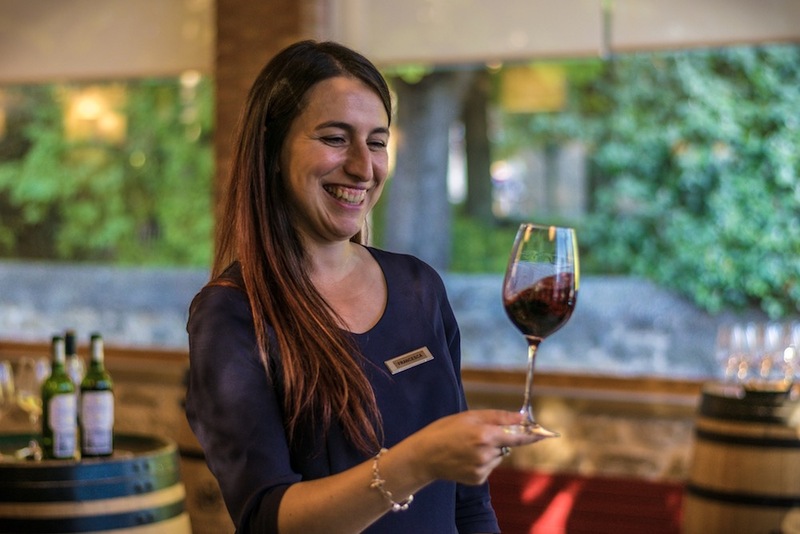 The bodega’s vines cover 12 hectares of the “sunniest slopes of Mount Talai Mendi” as Itziar, one of the owners, explained before topping up our glasses. I sipped gently from my glass and watched the moon cast shifts of silver over the tumbling vines, the bubbles of the wine dancing gently on my tongue. 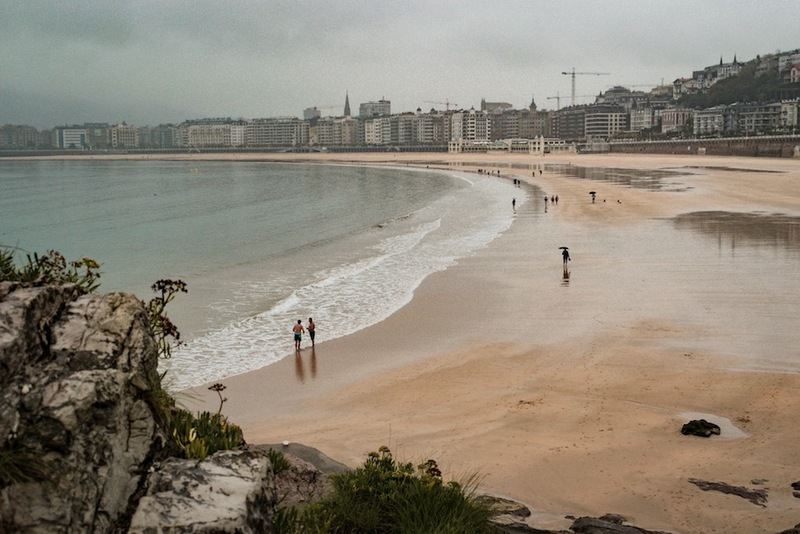 There’s something special about San Sebastian. It’s superior to any other seaside city you’ve ever visited. The beach is pristine and lapped by crystalline waters. The streets are clean, broad and handsome, packed with the city’s renowned pintxo (tapas) bars and Michelin-starred restaurants. And then there’s the manicured gardens and surrounding green-peaked mountains to provide a sense of serenity. The people, too, are beautiful and seem to dress elegantly even if they’re just popping to the shop to pick up some milk. It’s a real-life utopia. I’ve visited twice to date and the weather was bad on both occasions, yet I am still left with this faultless impression. From beneath my umbrella I strolled La Concha beach and explored the gardens of Miramar Palace, which was once the summer residence of Queen Isabella II. Even in the drizzle, it was impossible not to fall in love with the place. 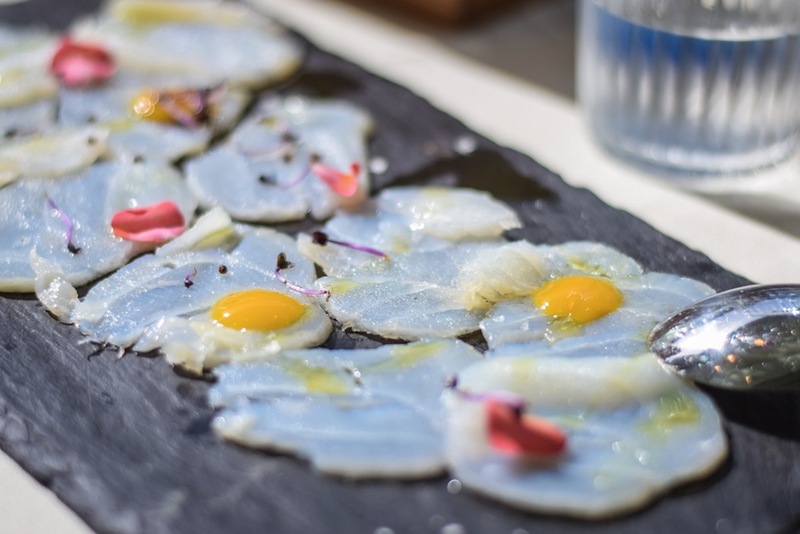 After checking in at the suitably stylish Hotel Barceló Costa Vasca and a quick freshen up, we head out in search of San Sebastian’s famous pintxos. 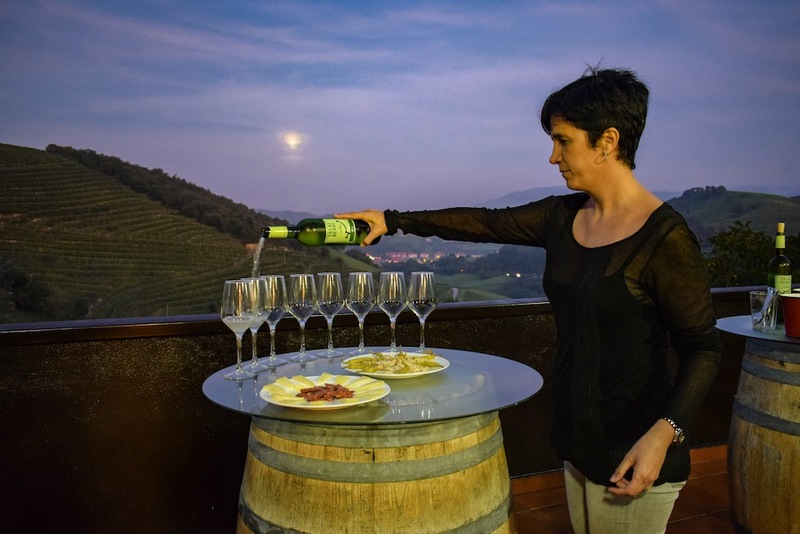 The most common question in the Basque Country: Another txakoli? It is only a Wednesday night, but the streets and bars of San Sebastian are packed out. 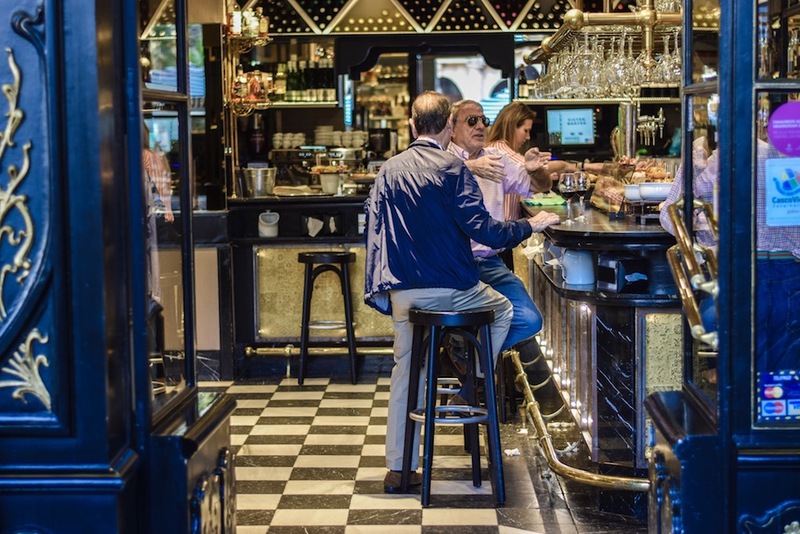 “This is something we do almost every day – we go out and meet our friends and family for a few pintxos and some txakoli, and then we go home to eat our main meal,” Ana explains as we elbow our way into a tiny bar. 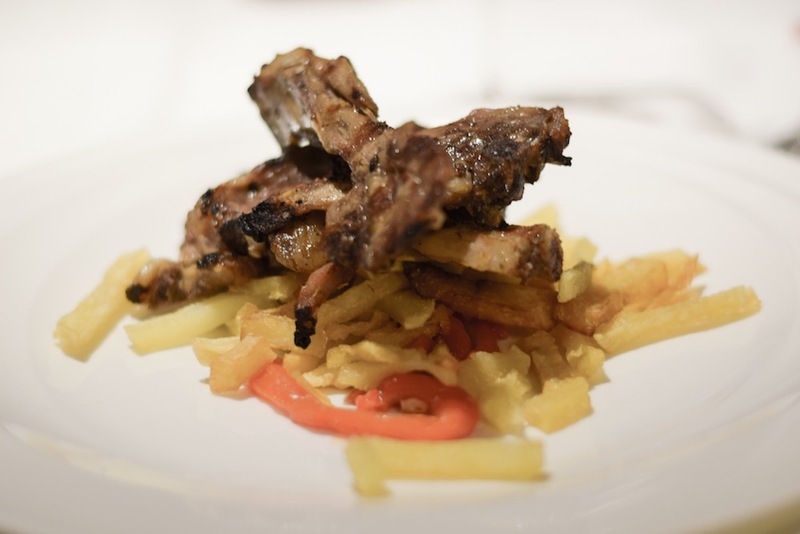 There are countless great pintxo bars in the Old Town, or “Parte Vieja” as it’s known locally, especially along the streets of Calle 31 de Agosto, Calle Fermín Calbetón, and Calle Mayor. But my personal favourite is the more relaxed Ganbara Restaurante. 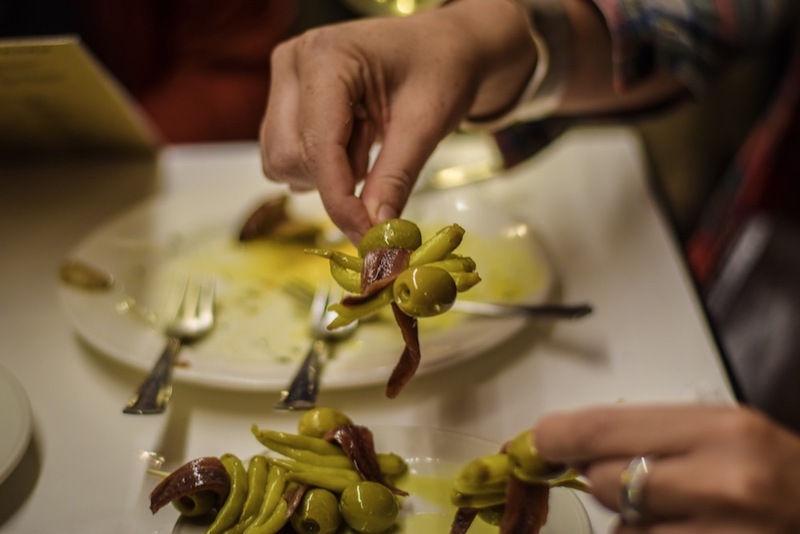 Don’t miss their rendition of the region’s famous “Gildas”, which are made by spiking pickled chilli peppers, anchovies and olives onto a toothpick – you wedge the whole thing between your teeth and eat it in one. This tasty little bite is relatively spicy by Spanish standards. It was named after Rita Hayworth’s raunchy portrayal of Gilda in the 1946 thriller, a film which, evidently, roused a few local chefs into creative culinary action. 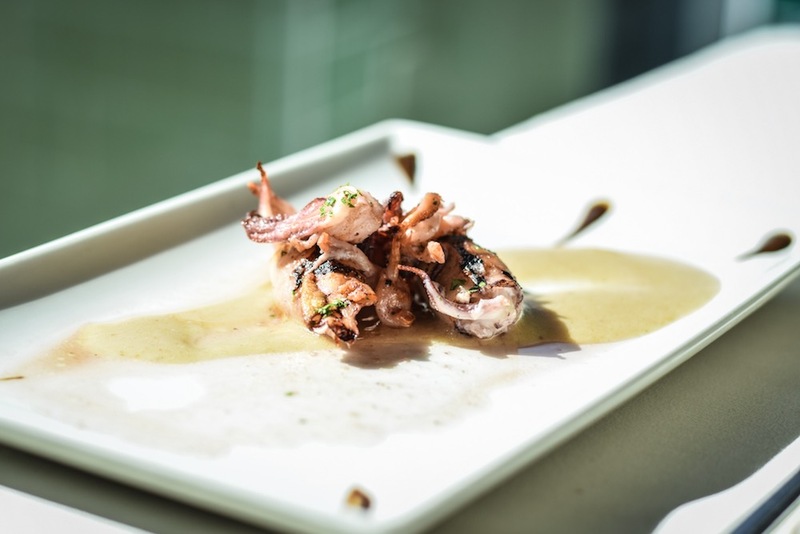 Pair with a bottle of txacoli or Rioja and you’ve got the makings of a memorable night. 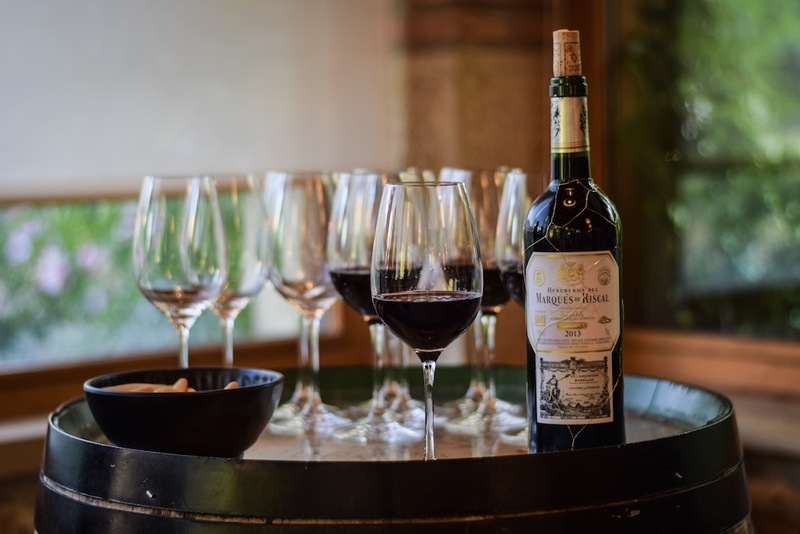 Ask anyone to name a Spanish wine it’s highly likely they’ll say Rioja, but very few people realise that part of this world-renowned terroir is located in the Basque Country. 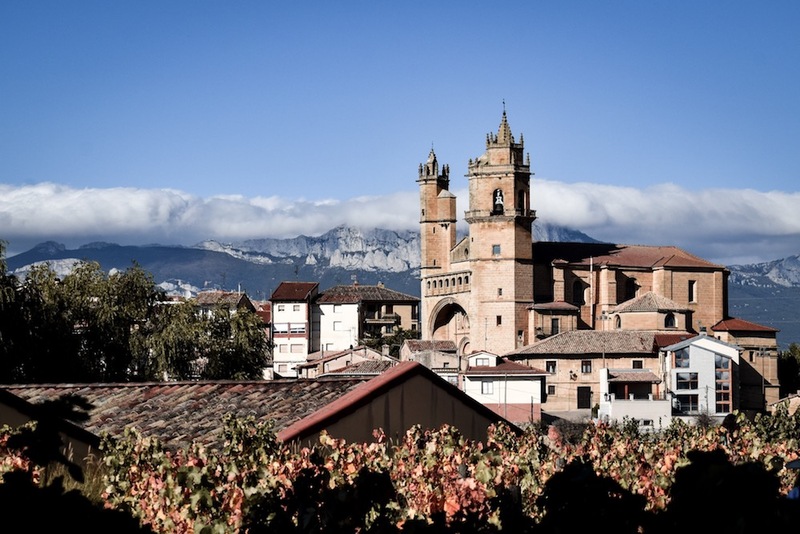 It’s referred to as Rioja Alavesa and is the smallest of the La Rioja sub-regions. 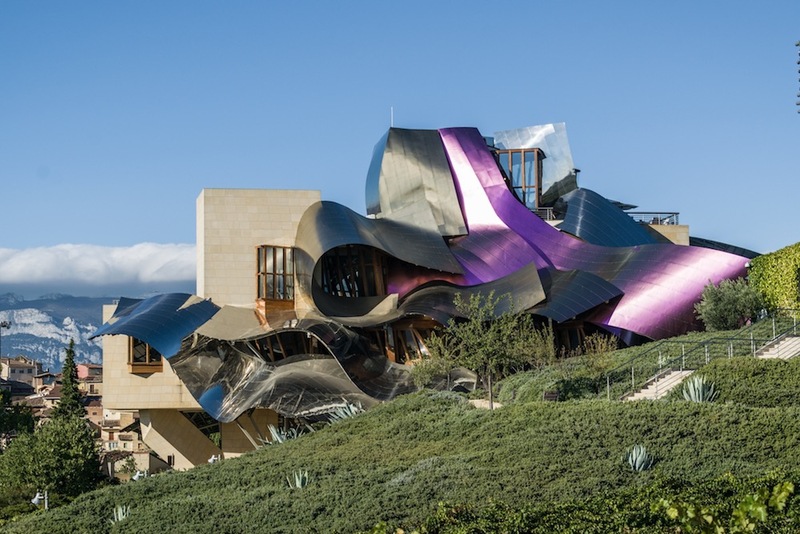 But despite its diminutive scale, it’s actually home to some of the most spectacular wineries in Spain, including the mind-bendingly beautiful Marqués de Riscal winery and hotel, which is anything but what you’d expect to find on a 150 year old vineyard. Designed by Frank Gehry – yup, the same Frank Gehry who designed the Guggenheim – it’s a bizarre and organic looking structure. Undulating ribbons of titanium form the roof, glowing with a soft violet hue that evokes images of the region’s famous red wine cascading into a glass. Although I’m not entirely sure he succeeded, Gehry wanted the building to blend in with its surroundings. Although I’m not entirely sure he succeeded, Gehry wanted the building to blend in with its surroundings. The stone used for the main walls is the same stone that was used to build the nearby church, majestic views of which can be enjoyed from the rooftop terrace bar, along with the awe-inspiring backdrop of the Sierra de Cantabria mountain range. I can imagine some architecture snobs might find it all a bit too much, but in my humble opinion this is one of the most spectacular buildings on the planet. I particularly enjoyed the wine tour and tasting session, exploring the dusty old cellars and tipping back a few glasses/bottles of the company’s excellent whites and reds with our lively guide Francesca. If all of this sounds like your kind of thing then you might like to check yourself in to one of the property’s 43 luxury rooms and suites for a few vino-fuelled nights. The five-star facilities include a gorgeous pool and spa, and an extended stay here would be high up on my list of places to visit when returning to the Basque Country. 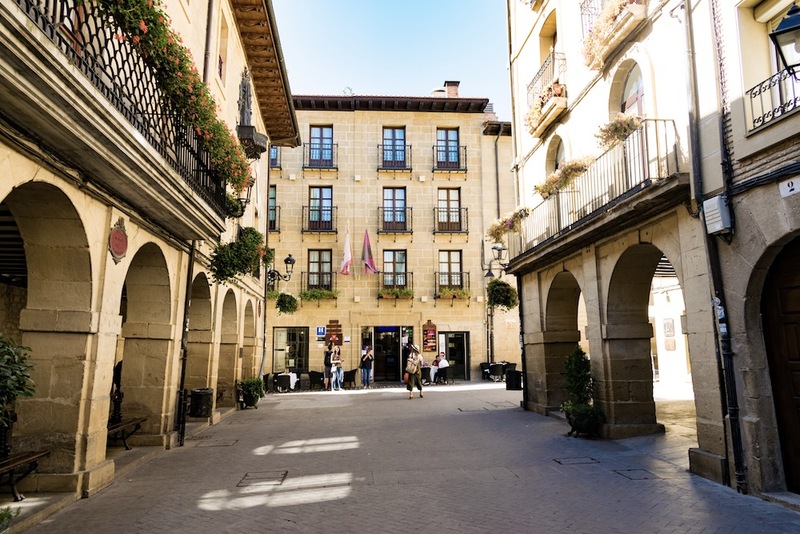 Rioja Alavesa is full of fairytale villages, but if you’re short on time you simply can’t miss Laguardia. Perched on a hill with commanding views over the rolling vineyards and surrounding mountains, it was once a fully-walled fortress. 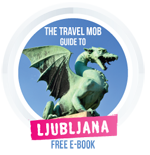 The ramparts still stand and to navigate the narrow little alleys and cobblestoned streets of this charming medieval town is nothing short of time travel. As I mentioned earlier, Vitoria-Gasteiz is actually the capital of the region, not Bilbao, and not to be left off any serious Basque Country itinerary. It’s a seriously vibrant and charming city, with a colourful Old Town (known as “The Almond” due to its shape) packed with bustling pintxo bars and restaurants. 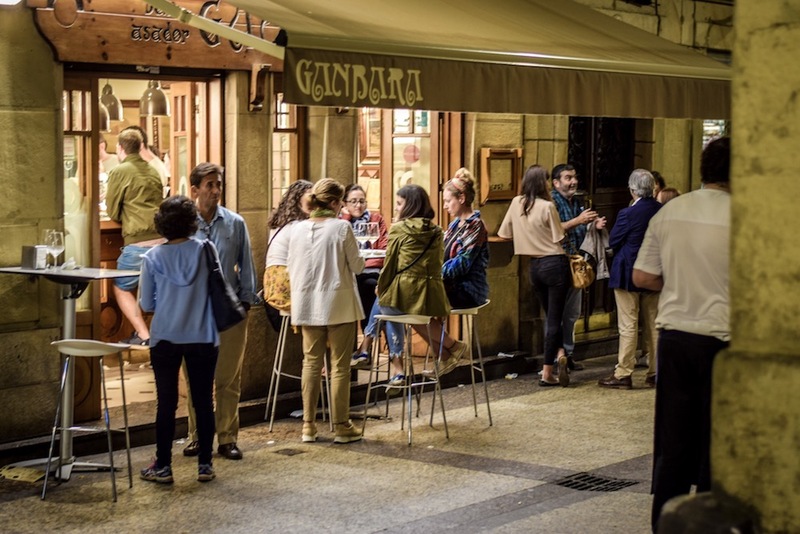 Don’t miss the perpetually rumbling Calle Cuchillería, where you could literally spend an entire day eating your way through the lively little bars. Vitoria-Gasteiz is also one of the greenest cities in Spain and even held the title of 2012’s European Green Capital. If you’re looking for a place to stay in Vitoria then I highly recommend the Silken Ciudad de Vitoria Hotel, which is located mere stumbling distance from the action. That’s not all the Basque Country has to offer. To read up on Guernica, the town whose fate inspired Picasso, txokos (private dining clubs), the Urdaibai Bird Centre with its Scottish Ospreys, the Albaola Sea Factory museum (for a fascinating insight into whaling), the UNESCO-listed Bizkaia Bridge, the beautiful town of Hondarribia, the Flysch Geopark and see some sunny photos of San Sebastian check out the Editor’s own list of things to do and places to go in the Basque Country. 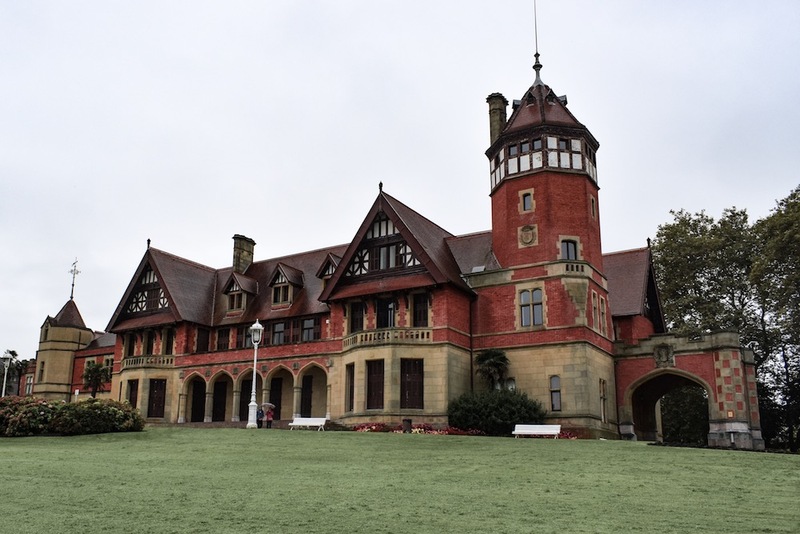 Ben was invited to the Basque Country as part of the #InGreenSpain blogtrip organised by Tourism Euskadi, the Spanish Tourist Office and The Travel Mob bloggers collective. 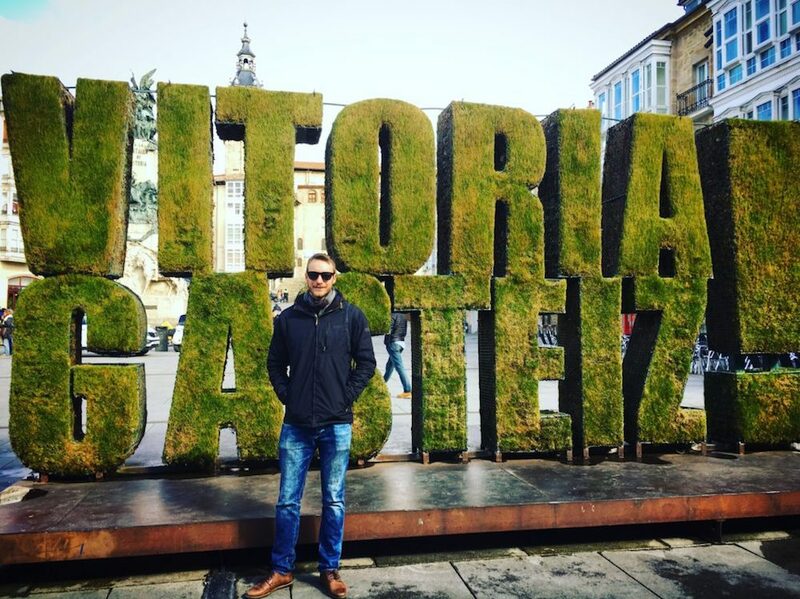 Subscribe to Urban Travel Blog and keep up with his adventures through the rest of North Spain, as he continues to lush Cantabria, breathtaking Asturias and epic Galicia.